One Year After The Election, Poliça's 'How Is This Happening' Is A Lush Lament Music For The Long Emergency comes from a year-and-a-half long collaboration between the electro-pop band and the classically-trained stargaze collective. One year ago today, American voters went to the polls, electing Donald Trump as the 45th President of the United States. Trump's election was many things to many people; a shock, a line in the sand, an emboldening jolt. For everyone, it appears in retrospect, Trump's empowerment was a turning point. 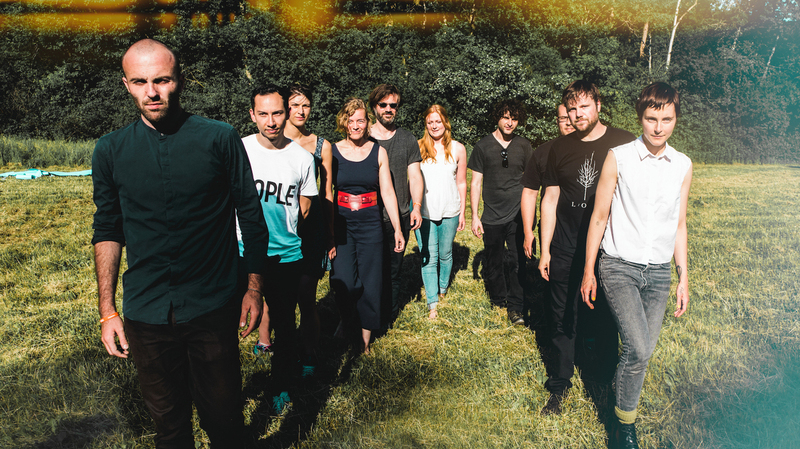 In Feb. 2016, the five members of Minneapolis-based Poliça were in the Berlin living room of conductor André de Ridder, meeting him and members of his stargaze (stylized as "s t a r g a z e") collective for the first time. All were there to poke around at the edges of a collaboration between the camps; de Ridder and his collective of classically-trained musicians — known for lush work in tandem with explorative artists and groups like Julia Holter, Nils Frahm and These New Puritans — and Poliça, driven by crystalline singer Channy Leaneagh and wildcard producer Ryan Olson's vision of deeply referential and often overcast pop that can digress wildly, and beautifully, into mutant kosmische concréte. An artistic handshake, with stargaze lightly improvising over Olson's work — "not even song structures, just electronic textures," says de Ridder in a statement — at that initial meeting led to a year-and-a-half long collaboration, with intermittent rehearsals and detailing done over the digital wires. This process yielded Music For The Long Emergency, recorded at the Eau Claire, Wisc., studio April Base, Justin Vernon's sanctorum (one that both Leaneagh and Olson visit frequently). "How Is This Happening," the first release from Music For The Long Emergency that we're premiering here, opens like a maudlin sunrise. Leaneagh wrote its lyrics — expressions of emboldened shock, "How is this happening?" and "We have got / a lot / of work to do" and "I'll fight until my days are done" — the day after Trump's election, and the nerve that Trump's election exposed is clear here, delivered with a breathy, weary and pastoral lament. The piece quickly begins to undulate into its center zone; a dystopic oscillation, weeping sweep of strings and deeply pained chorus of French horn. "I think that the two bands," Leaneagh writes of the collaboration in a statement, "even though we're different instrument-wise, we both operate in similar fashions. So I think this was able to be a beautiful, anarchistic thing." Hope for a bright future isn't easy to find, perhaps, in the music — but it was, and will remain, in the collaborations. "New ideas are happening," de Ridder says, "and these residencies are spreading and we're introducing other musicians to each other, so there's a real legacy that's come out of it. We feel we're going to be good friends and colleagues for the rest of our lives." Music For The Long Emergency comes out February 16 via Totally Gross National Product/Transgressive Records. A short supporting tour is also planned for February.